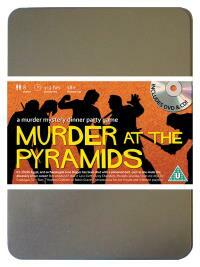 You've been invited to play the role of TOM-TOM in Murder at the Pyramids. Egypt, 1924, and archaeologist June Digger has made the most incredible discovery of the century. Friends and luminaries have gathered to witness her findings but before anyone can say “Tutankhamun”, June is found dead, killed with a poison dart shot from a blowpipe. This was no curse, this was murder! Host your own party to find out who snuffed June’s candle! Egyptian Guide (he’ll get you from A to B quickly!) Costume Suggestions : Your well-worn sandals and dusty white robes hint at your occupation as a local guide. And if that wasn’t enough, your backpack, compass and folded map are a dead giveaway. Glasses and moustache complete the picture. I was Ms Digger’s local guide. Even though I am just a poor ordinary Egyptian citizen, my local knowledge was much valued by the archaeologist. I was very proud to have been picked for the job and although it was hard work, it was worth it to be part of something so important to my country’s cultural history.